Hello all, we are Hammer Falcon. A small indie game company from New Jersey, and we would like to introduce you to our very first (and very still in production) game currently titled Project Z01. A game which was sparked to life by the Kill Screen CREATE Game Jam sponsored by OUYA and Unity. Starting back on January 14th, our team of 3 with very little experience in Unity dove head first into learning and creating a prototype to submit. Project Z01 will be a RPG based zombie shooter, but before you say "OH NO NOT ANOTHER ONE!" and run screaming we want to outline what we hope to accomplish. We have series of goals that we feel will create a unique and different style of game play for the users based upon our somewhat traditional RPG system. Allowing the player to upgrade their weapons, skills, vehicles, and even their home base which will reflect the upgrades as the player progresses. The environment we are hoping for is cross between open world and mission based levels, ranging from suburbs to grungy warehouses. We intend to bring in 4 player co-op but are currently concentrating on single player game play. Thanks for reading this so far, as a reward here are a couple of concept characters we hope to introduce into the game. 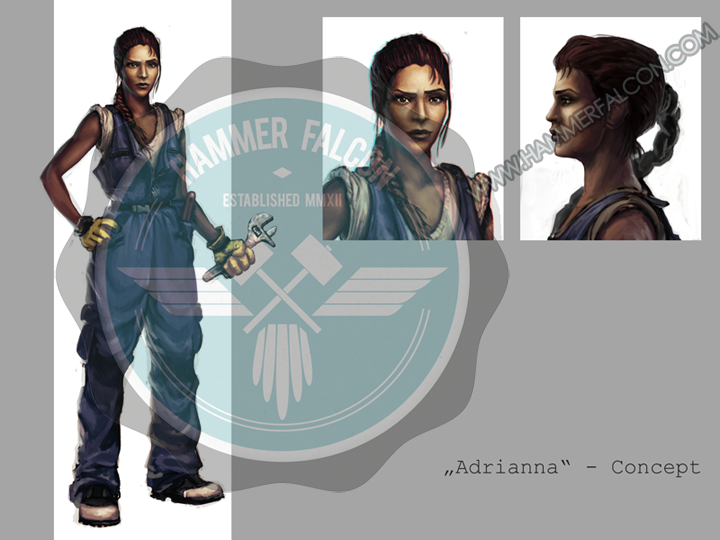 News / Welcome to Hammer Falcon! We are just about done getting things all setup on the business end of things here, but soon we will have everything up.